" and subscribe to the series. - Ed. In the last few weeks, we made Gmail better for iPhone and iPad users and improved Google Docs with easier image uploads to documents and enhanced charts in spreadsheets. The business and education crowd will enjoy the addition of automated workflow capabilities in Google Sites, the ability to remotely manage security on Android devices and a new batch of third-party applications that integrate with Google Apps. 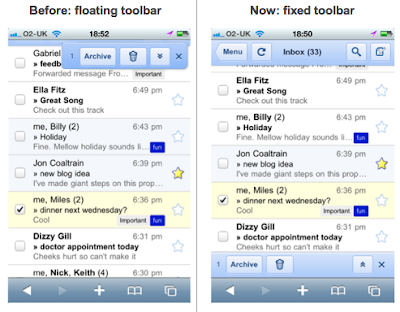 If you’re reading this post on an iPhone or an iPad, head over to gmail.com to see how we made the Gmail experience in mobile Safari work more like a native application. First, scrolling is a whole lot more responsive to your touch gestures. A quick flick will scroll the page much faster than before. We’ve also improved the toolbar so it stays put at the top of the screen, even when you scroll down a long page. This keeps the most common actions in Gmail right at your fingertips—literally. Last Tuesday we added the ability to drag and drop images to Google documents from your desktop or from folders on your computer. You can still add images through the image upload wizard, but this new method can save time, especially when you have several images to add. This week we also rolled out improvements to charts and visualizations in Google spreadsheets. You can now add annotated timelines, organizational charts, gauges, motion charts that visualize data changing over time, and other chart types more easily. The new chart editor helps you customize the design of your charts, and now you can publish dynamic charts on other web pages that automatically update when data in the source spreadsheet changes. Last week we introduced the ability for you to add automated workflow to Google Sites, powered by Google Apps Script. Scripts automate tasks such as sending emails, scheduling calendar events, creating and updating site pages using data from other systems, and more. For example, you can put a button on a course registration page that adds the course to the user’s calendar, sends them a confirmation email and includes their name in the course roster within the site. Just yesterday, we added the ability for businesses and schools using Google Apps to remotely manage security on users’ Android devices (Android 2.2 and beyond), whether those devices are user-owned or provided by the organization. 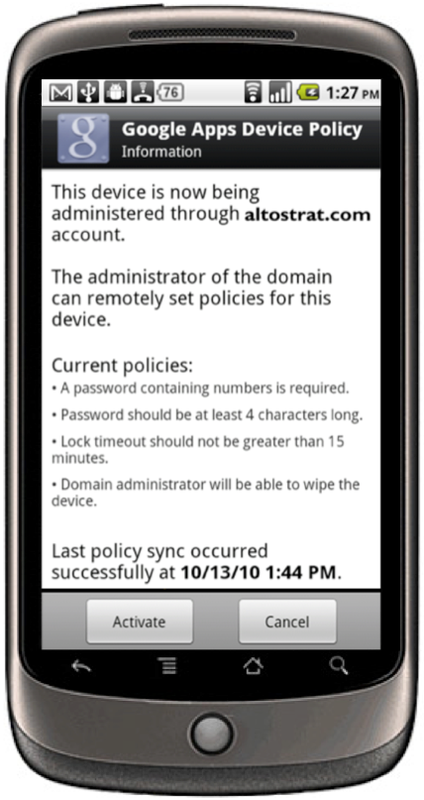 This update rounds out our device management capabilities; now administrators can perform functions like remotely wiping Android, iPhone, Windows Mobile and many Nokia phones from the Google Apps control panel without needing any special hardware or software. 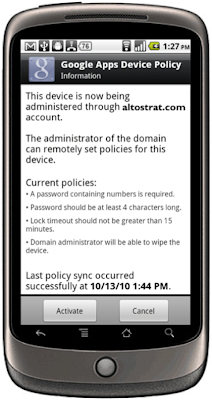 Administrators running BlackBerry® Enterprise Server can manage their users’ BlackBerry® devices from the control panel as well. The number of third-party software applications available in the Google Apps Marketplace that seamlessly integrate with Google Apps continues on its rapid growth trajectory. This month, we added seven new applications that complement the growing set of applications offered directly by Google. We were especially pleased to see strong international representation among this new crop. Google Apps is really taking off, and we’re excited to team up in the cloud with Virgin America. But they’re not the only large organization to “go Google” recently. Multnomah County in Oregon is moving 4,500 county employees to Google Apps, and the state of Wyoming is doing an even larger deployment with 10,000 state employees. Across the board, these organizations chose to switch because of substantial cost savings and tremendous productivity improvements made possible with Google Apps. In the last few weeks alone, tens of thousands of small and mid-size businesses have switched to Google Apps, too. Several of these new customers have shared their stories with us, and we invite you to read more here: Jason’s Deli, MainStreet Advisors, Melrose Resources, American Support and Premier Guitar. We also reached a big milestone in the education world recently: more than 10 million students, faculty and staff are actively using Google Apps at schools and universities worldwide. While we’re focused on bringing the next 10 million education users onto Google Apps, we still took some time to celebrate how far we’ve already come—with the help of the USC marching band! I hope these updates help you and your organization get even more from Google Apps. For details and the latest news in this area, check out the Google Apps Blog. 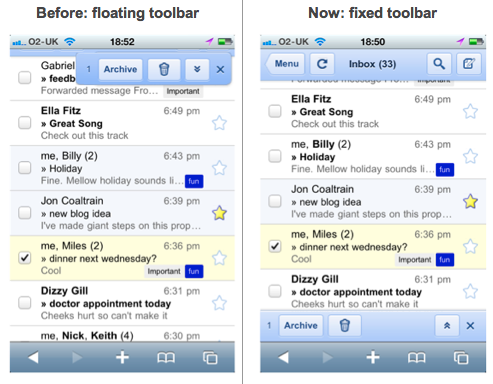 This is part of a regular series of Google Apps updates that we post every couple of weeks. Look for the label “Google Apps highlights" and subscribe to the series. - Ed.